We will be pleased to welcome Staci L. Catron, Cherokee Garden Library Director, Atlanta, History Center and Mary Ann Eaddy, Historic Preservationist, to our May 2, Grow and Read series. These two women are the authors of Seeking Eden: A Collection of Georgia’s Historic Gardens. 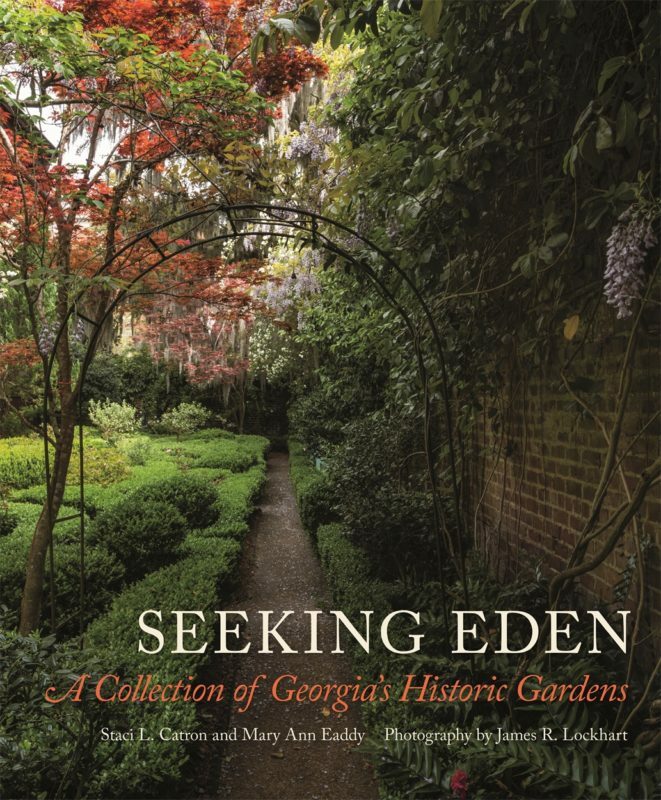 Seeking Eden promotes an awareness of, and appreciation for, Georgia’s rich garden heritage. Updated and expanded here are the stories of nearly thirty designed landscapes first identified in the early twentieth-century publication Garden History of Georgia, 1733–1933. Seeking Eden records each garden’s evolution and history as well as each garden’s current early twenty-first-century appearance, as beautifully documented in photographs. Dating from the mid-eighteenth to the early twentieth centuries, these publicly and privately owned gardens include nineteenth-century parterres, Colonial Revival gardens, Country Place–era landscapes, rock gardens, historic town squares, college campuses, and an urban conservation garden. Seeking Eden explores the significant impact of the women who envisioned and nurtured many of these special places; the role of professional designers, including J. Neel Reid, Philip Trammel Shutze, William C. Pauley, Robert B. Cridland, the Olmsted Brothers, Hubert Bond Owens, and Clermont Lee; and the influence of the garden club movement in Georgia in the early twentieth century. $54.50 including tax. Book proceeds will go toward the Garden Club of Georgia’s Historic Landscape Preservation Grant program. Matching grants provide seed money to nonprofits and local governments working to preserve and restore historic landscapes across the state. Staci L. Catron serves as the Director of the Cherokee Garden Library, a Library of the Kenan Research Center at the Atlanta History Center. She manages the development, preservation, and interpretation of the collection of 32,000 items, which includes rare books, contemporary volumes, manuscripts, photographs, landscape architectural drawings, periodicals, seed catalogs, and ephemera. Catron holds a B.A. in History and Latin, as well as a Master of Heritage Preservation. She curates numerous exhibitions at the Atlanta History Center, lectures regularly regarding rare garden books and historic landscapes, and is published in many newsletters, journals, and books. A lifetime member of Garden Club of Georgia (GCG), Catron is a past president of the Southern Garden History Society, serves on committees for GCG and Garden Club of Virginia, and is a member of the Society of Georgia Archivists and Council on Botanical and Horticultural Libraries. In 2014, she was named an Honorary Member of The Garden Club of America. Mary Ann Eaddy has worked in the fields of historic preservation and history throughout her professional career. A former manager in the Historic Preservation Division of the Georgia Department of Natural Resources, Ms. Eaddy has experience both in Georgia and South Carolina’s State Historic Preservation Offices as well as in the National Park Service. For twenty years she taught a graduate course in Preservation Planning in the Heritage Preservation program at Georgia State University. Ms. Eaddy earned her B.A. in History from Winthrop College in South Carolina and her M.A. in American Studies from The Georgia Washington University in Washington, D.C. She was inducted into the Sigma Pi Kappa Preservation Honor Society in 2006. A lifetime member of the Garden Club of Georgia, she is a member of the organization’s Historic Landscape Preservation Advisory Committee. James R. Lockhart is a photographer specializing in architectural and landscape photography. Now retired, he documented more than sixteen hundred nominations to the National Register of Historic Places in his role as photographer for the State of Georgia, Historic Preservation Division.